The Whiteleaf Centre has been one of the most significant developments for Oxford Health NHS Foundation Trust in recent years. The building cost £42.8m and marked a significant improvement from the previous facilities in Aylesbury and Stoke Mandeville. The building has lots of flexible space so it can respond to the changing needs of both our patients and the Trust in the future. The Whiteleaf opened for the delivery of patient services in February 2014. 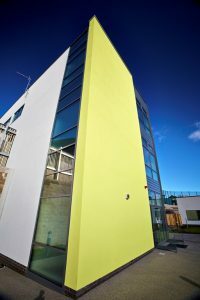 The building has been designed to be environmentally sustainable and includes many eco-friendly features such as ground source heat pumps and natural ventilation. The environment in which people are cared for has a significant impact on their experience, recovery and well being. The hospital uses lots of natural light and ventilation, providing a spacious and welcoming feel. The Whiteleaf incorporates artwork in many aspects of its design, including a wall mounted sculpture outside the main entrance. Artwork by Chris Tipping, based on local wildlife and garden designs, has been added to large areas of glasswork in the resource centre. 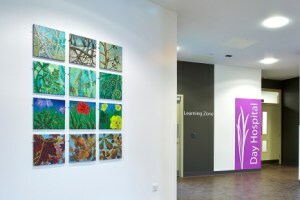 Several new artworks by local arts can also be seen in the Resource Centre. 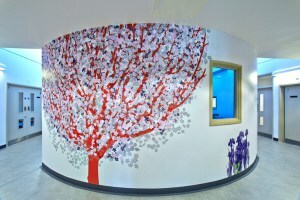 The garden theme continues on the wards with bespoke wallpaper featuring trees from around the site.